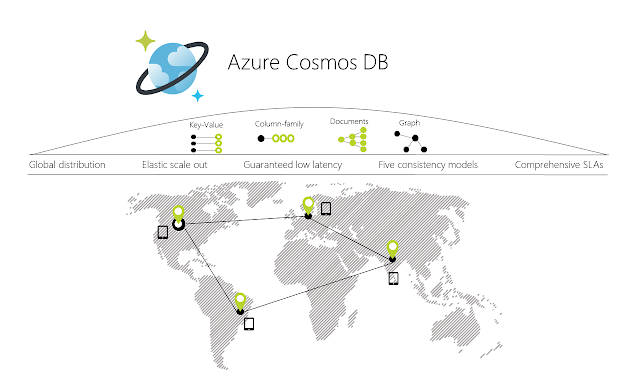 Azure Cosmos DB has to be one of my favorite databases due to the breadth of available database types, its choice of consistency models and elastic scale out. An introduction can be read here. A definition for each of these types of databases is given. A key-value pair (KVP) is a set of two linked data items: a key, which is a unique identifier for some item of data, and the value, which is either the data that is identified or a pointer to the location of that data. Key-value pairs are frequently used in lookup tables, hash tables and configuration files. A column-oriented DBMS (or columnar database management system) is a database management system (DBMS) that stores data tables by column rather than by row. A graph database, also called a graph-oriented database, is a type of NoSQL database that uses graph theory to store, map and query relationships. Every node in a graph database is defined by a unique identifier, a set of outgoing edges and/or incoming edges and a set of properties expressed as key/value pairs. The five consistency levels offer predictable low latency guarantees and multiple well-defined relaxed consistency models. Linearizability. Reads are guaranteed to return the most recent version of an item. There is a useful capacity planer that looks at request units throughput per second, request unit consumption and the amount of data storage needed by your application.